The Oregon Weekly reports on an initiative in Eugene, OR that brings volunteers together to provide not only basic medical services but also a haircut some food and a friendly chat. What do you do if you are homeless, uninsured or just plain broke and you’re sick? Where do you go if you do have a home but the waiting list is too long at the clinic or your insurance isn’t good enough to get you the care you need? “You can’t just not help people,” says herbalist Sue Sierralupe. She’s the clinic manager for Occupy Medical, a team of volunteers who donate their time, skills and care to making sure anyone and everyone in Eugene has access to health care. From a patient’s perspective, it’s what single-payer health care looks like, Sierralupe says, and it’s free. 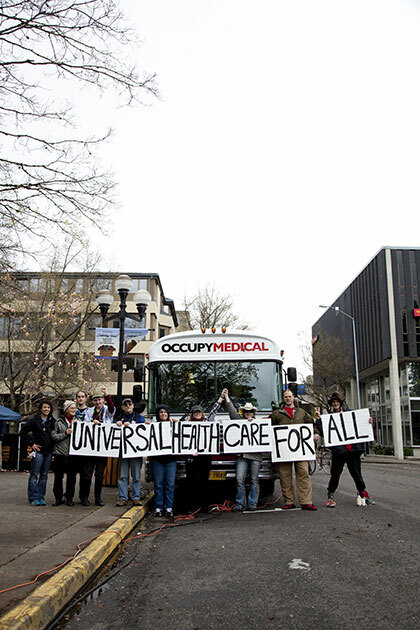 On Sundays from noon until 4 pm you can walk up to the former bloodmobile painted red and white and emblazoned “Occupy Medical Mobile Clinic,” that’s parked downtown at the Park Blocks and get anything from a Band-Aid to a prescription for heart medicine. You can also get food, a haircut and proof that someone cares. “We’re really showing people what it would be like if people really had direct access to health care regardless of their income status,” Saint-Louis says. Patients come with anything from wounds that need first aid, to chronic conditions like diabetes that require monitoring.